Friday lay day – Greece back in recession but austerity works doesn’t it? Its the Friday lay day blog and here are some snippets from the week. The Hellenic Statistical Authority (EL.STAT) released the latest – Quarterly National Accounts ( 1st Quarter 2015 ) – on May 13, 2015. 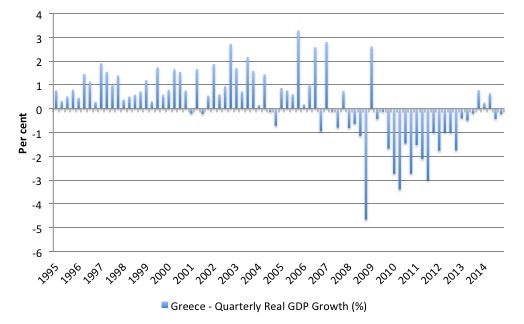 After all the claims that austerity was working and the Greek economy was growing again, we now learn that Greece is back in recession, having recorded two successive quarters of negative real GDP growth. Whatever way one spins it, the policy framework employed by the Eurozone is a failure. The national accounts data released by Eurostat which coincided with the Greek release – GDP up by 0.4% in the euro area and the EU28 – also shows that the German economy slowed considerably in the first-quarter 2015 and Finland, one of the fiercest supporters of austerity entered official recession. The Finnish response was they had to cut public spending harder because they would be in breach of the Stability and Growth Pact rules relating to size of the deficit and the volume outstanding public debt. These nations are so caught up in neo-liberal Groupthink that they cannot see how ridiculous their policies and supporting dialogue have become. The following graph shows the quarterly growth (per cent) in real GDP growth for Greece from the first-quarter 1995 to the first-quarter 2015. The point that I find amazing is with all this talk of lazy Greeks, non-taxpaying Greeks, Greeks enjoying the good life with generous pensions and low public transport prices and all the rest of the claims, prior to joining the Eurozone the economy grew consistently with more stability and much lower unemployment. These so-called structural impediments were around then. They didn’t suddenly materialise after Greece joined the Eurozone. The problem with Greece is they can no longer use the State currency monopoly to defend its standard of living because they gave it up. And that is the solution to the problem – to restore it. All the negotiations with the Troika about how much or how little austerity will continue are not the answer. It is patently obvious that austerity has categorically failed in Greece. Large-scale stimulus is required. That will not happen while Greece remains bound by the ridiculous fiscal rules that are required to be obeyed if a nation is a member of the common currency. I thought this comment about Syriza by the Hungarian Marxist intellectual, G.M. Tamás in the Jacobin article (May 12, 2015) – Socialism and Freedom – was interesting. … a very noble and very courageous attempt to improve the material circumstances of the working classes, of the unemployed, and of the miserable underclass through moderate reforms which — in this profoundly reactionary period — appear as unspeakably radical to mainstream opinion. That is how far the pendulum has shifted to the free market right over the last several decades. G.M. Tamás also noted that the essentially conservative “Roosevelt, too, was called a communist back then by his opponents” when he introduced the fairly moderate New Deal in the US during the Great Depression. The internationalism of capital is not countered by an internationalism of labour; there you have the reason for “populism” in a nutshell. Bourgeois egalitarianism stops at the boundaries of the nation-states, but capital doesn’t. This is why Western and Central European social democracy won’t support Syriza. All the more reason for building a strong state that is not ‘pro-business’ but pro-people and recognising the capacity of the state, itself to produce things of worth and create productive jobs. The elevation of the business sector as the only sector capable of producing jobs, income and wealth distorts reality and will generally lead to poor outcomes for all. There was another interesting article in the Jacobin Magazine (May 14, 2015)- The Future of Podemos – which bears on our discussion this week about the meaning of Labour-type parties and is also relevant for the problems that Syriza faces – trapped between a desire to abandon austerity and the reality that the Greek people want to remain in the Eurozone. The Podemos article notes that the leader of Podemos has recently introduced the work of – Antonio Gramsci – which I found uplifting. 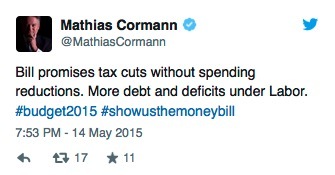 Imagine the leader of the Opposition in Australia (Labor Party) invoking such intellectual ideas. He is too busy outlining how he will cut the fiscal deficit more quickly than the conservatives. Phew! … have always understood that direct information about social phenomena and the political situation is required — at least if you want to build and organize emerging political realities, and not simply reproduce the most static ideological elements of the moment. In his work on cultural hegemony, Gramsci considered that issue in minute detail. Transformative movements have to educate the people and to build an ideology where the masses do not identify that their best interests are served by advancing the best interests of the elites (bourgeoisie). In that sense, a sort of ‘working class intellectualism’ is required where the people understand what happens and why. Adult education is as important as the standard forms of formal education that our children endure. If a political movement becomes captured by “opinion polls, talk shows, and electoral polling” as Podemos appears to be at present (according to the article) they do not become leaders. The popularity they might achieve “is little more than an illusion” that can shift quickly as the elites through a compliant media work the population over. The subjective declaration “I am a moderate” comes to mean the same thing as “I am middle class,” and makes little sense in a context in which the material conditions of the middle class are being demolished. By abandoning the radical space and trying to be moderate, political parties leave the space open for other groups – and then we get right-wing parties forming that appeal to more basic instincts in a population that has been left ignorant of most things. The point is that transformative movements take time to gather support. Education is a slow process and in early days costs votes in elections. But the investment pays off eventually if the conditions are right. In Greece, there is little discussion about the alternatives. Almost no coherent discussion occurs about what might actually happen if they exit the Eurozone. That option has just been scaremongered away and basic instincts dominate. In that sort of ignorance, a transformative party like Syriza will fail. Perhaps it came to power to quickly. Perhaps it doesn’t actually want to govern within a currency monopoly. If it thinks it can be a better government within the fiscal rules imposed by the Eurozone, then it is deluded. Any government in that context is really just standing on the bridge of a sinking ship. In his reply to the Federal fiscal statement last night, the leader of the Opposition announced to the Federal Parliament that, if elected, the ALP would write off all student debts for science graduates in Australian universities, more specifically STEM graduates (Science, Technology, Engineering and Mathematics). Apparently, the other disciplines like those in Humanities and Social Sciences are not deemed to be seen as contributing to the future well-being of Australia. This is a crazy policy and will further disadvantage the Humanities and Social Sciences, which are already struggling in the user-pays world where there are job shortages (often due to public sector cutbacks). What sort of world does the ALP conceive? If that wasn’t bad enough, the major debate about the proposal has centred on the complaint that the government “has no idea of paying for it”. The Chamber of Commerce and Industry claim the plan is unaffordable and without “substance”. We are talking about a currency-issuing government here. They can pay for it with the stroke of a computer key should they so desire. The response of the Government was equally ridiculous and totally hypocritical. Bill is the Opposition leader, Bill Shorten. It is a funny thing for the Finance Minister to tweet given his Government (thankfully) has failed to meet their own fiscal contraction plans and will have fiscal deficits at least until 2018-19 by their own plans. His government has expanded public debt and the fiscal deficit substantially. While there is no problem with that fact, although it reflects the real problem, declining growth rates and rising unemployment, it is amazing that they still think they can beguile the population into believing they are acting in a qualitative and quantitatively different manner to the Labor Party. If not ‘rorting’ and ‘fraud’ … read on (laughing). In a Fairfax media report today (May 15, 2015) – Senior Abbott ministers outed as ‘double-dippers’ as fairness debate rages – we learn that “Two of the Abbott government’s most senior finance portfolio ministers have been revealed as ‘double-dippers’ on paid parental leave”. The reference to ‘double-dipping’ is the recent attack by the Prime Minister and the Treasurer on parents that were receiving specific parental leave payments that they had negotiated with their employers and then accessing the public scheme that is available to all. The Treasurer told the media (before it was revealed that the two senior ministers were ‘double-dipping’) that the practice of people availing themselves of the two schemes was “basically fraud” while the Minister for Social Services said that they were “rorters”. Mass denial is now in being practiced by the Prime Minister and others about what was said. As I have been working this morning I have been listening to one of my favourite bands or as they call themselves, a music collective, the – Brooklyn Funk Essentials. The Album is – Cool, Steady and Easy – from 1995. The track is – Take the L Train (To 8th Avenue). Gorgeous. Helps one cope with being an economist on a daily basis. Here is the commentary from the First Dog on the Moon on this week’s Australian Government fiscal statement – First Dog on budget 2015: how to forget how bad last year’s one was. About as stupid as the real thing but certainly not as damaging to our well-being. You might care to share my blog that expands a recent Daily Mirror article on survival tips for UK’s poor’s growing hunger threat under the massive austerity cuts yet to come. Hope it helps people in dire straits. And helps people helps those folk. Hi bill, while I hear and understand you regarding Labor’s policy failures at least they are giving us a vision for the future that is sickeningly and severely sadly lacking from the current government. We can only hope for an early election and that a party has the courage to start a discussions about what the role of government should be and the type of society we want collectively. As noted it will take a long time for that discussion to get through to people. Have you been able to talk to the labor party or Chris Bowen in particular? It would help if our would be treasurer could at least start to try to u see stand MMT? Wayne swan sadly let us down after his GFC saving budget for AUSTRALIA. Why did he have to start talking about surpluses so much afterwards blows my mind still. It gave the opposition the narrative they wanted. When Kevin Rudd resigned from the ALP leadership in the aftermath of the 2013 election there were only 2 people who put up their hands for the leadership – Shorten and Albanese. At the time I thought that Albanese would have been the better choice. In fact,he was supported by the ALP rank and file but Shorten got the job thanks to the ALP hierarchy. Now we are seeing the results of the craven political machinations within the ALP – an opposition leader who might be a nice bloke but who won’t oppose in any meaningful way. Shorten doesn’t have the cojones to be an effective leader of the opposition and he certainly does not have the ability to be a head kicking PM,which is what is needed given the parlous state of the natiion. Politics is organised spin and lying. And this rabble has spectacularly failed the test of lying in a convincing manner – their bread and butter, so to speak. Even the meanest intellects within the electorate are beginning to recognise that they have been deceived and conned. Not only that, the perception of a significant proportion of the population (sufficient in number to change government at the next election) is that this lot has also failed the test of putting together a coherent economic policy. Here WTF? Central bankers are seen as Gods. Re: last dog on the moon. What I like about MMT is that it does not reify money. That is to to say, it is does not make the mistake of believing or positing that fiat money is concrete or real. MMT recognises that fiat money is a notional category, a unit of account which counts notional quantities. MMT itself is concerned with the real economy; real people and real production. It is fundamentally important that we understand the difference between real systems and notional or formal systems. Understanding this distinction is the key to developing an accurate understanding of economics and political economy. Real systems are the physical, chemical, biological and ecological systems which obey the discovered (and as yet undiscovered) universal laws which those sciences describe. Formal systems include languages, mathematics, logic and any other formal systems (e.g ideologies) built up from those “basic” formal systems. What is the point of formal systems, invented systems? Well, they have several points but the point we are concerned with here is encapsulated by the notion of “analogical congruence”. Certain formal systems (for example maps or building plans to take simple examples) rely on “analogical congruence” for the usefulness. The formal system must reproduce with analogical accuracy some aspects of the real world, for example dimensions and measurements within those dimensions in the case of maps and building plans. Thus with money, it is only useful, as a formal system, if it possesses (as the entire money system) some form of accurate analogical congruence with the real world. The aspect we are most familiar with is “valuation congruence” which we might also call “value equivalence”. We can value very different items in a common unit of account. The surest way to misconstrue and misuse the money system in macroeconomics is to regard money as real rather than notional. There is no formally correct answer to the question “What is the best deficit or surplus to have in a budget”. As Bill correctly tells us over and over, the empirical answer in praxis is whatever number (deficit or surplus) gives the desired real outcomes. If your desired real outcomes are full employment and full capacity utilisation you will get one set of budget numbers as the answer; rather you will get these numbers by a sort of practical differential calculus. You will keep setting budget number to approach closer and closer to this goal. However, if your desired real outcome is one which creates, maintains and privileges a super-rich minority at the expense of everyone else and indeed of the environment then you will get a different set of numbers. Of course, plans rely on real resources. Presuming adequate real resources, a set of plans can lay out great mansions for a few and hovels for the rest. Or a set of plans could lay out reasonable and eminently liveable quarters and conditions for all.